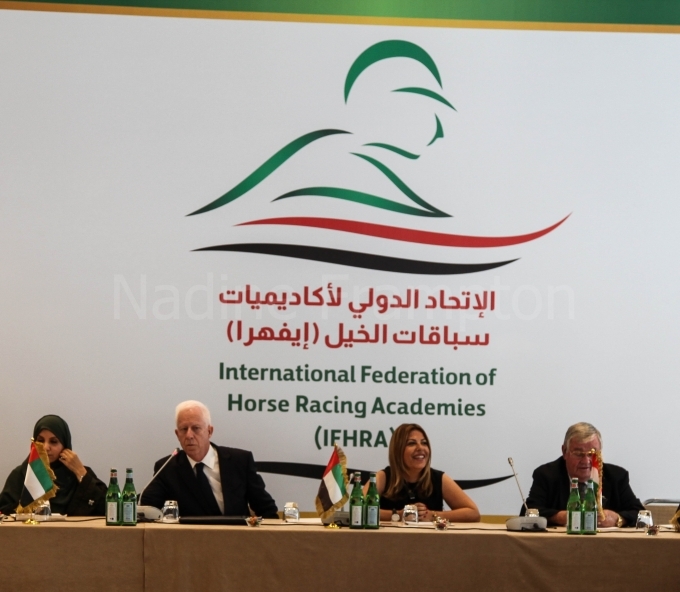 The IFHRA meeting was held on the sidelines of the The HH Sheikh Mansoor Bin Zayed Al Nahyan Global Arabian Horse Flat Racing Festival�s sixth World Arabian Horse Racing conference held in Warsaw in Poland. As many as 20 representatives from different parts of the world attended the executive committee meeting of the newly formed International Federation of Horse Racing Academies, IFHRA, on Thursday, February 12, 2015, in Abu Dhabi, after it was officially launched by Mr Khalid Hussein, from the General Authority for Youth and Social Affairs, UAE, in the presence of several senior officials from the key UAE government departments. The meeting was deliberated by Ms Lara Sawaya, President of IFHRA and was supported by Mr Remi Bellocq, IFHRA Secretary and the USA representative member in the Federation. International Federation of Horse Racing Academies, IFHRA, comes under the umbrella of HH Sheikh Mansoor Bin Zayed Al Nahyan Global Arabian Horse flat racing Festival. Several issues were discussed during the meeting including the setting up of many sub-committees, which included Academic Committee, Student Exchange Committee, Scientific Committee and Nomination Committee, creation of a user-friendly website, statuettes, roles of several officials, accident insurance coverage, and the importance of scientific research to help boost the morale of jockeys. The meeting also finalised two media coordinators apart from finalizing representatives from six more countries. Ms Lara Sawaya stated that with the admission of Norway into the Federation, Scandinavian countries' interests have been taken care of while reiterating the importance of representatives from other GCC countries. 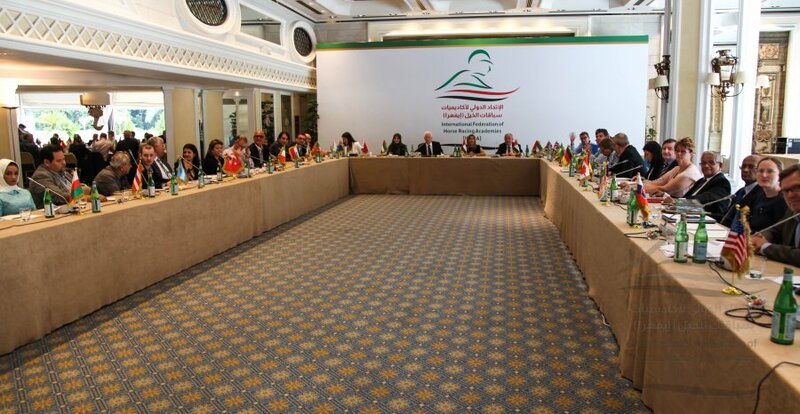 Countries who participated in the meeting included The United Arab Emirates, France, the United States, Australia, Great Britain, Korea, Germany, Ireland, South Africa among others. Ms Lara Sawaya was elected to head two core committees : nomination committee and scientific research committee. The HH Sheikh Mansoor Bin Zayed Al Nahyan Global Arabian Horse Flat Racing Festival is sustained by the Abu Dhabi Tourism and Culture Authority and coordinated by Abu Dhabi Sports Council, with National Feed and Flour Production and Marketing Co. LLC as associate sponsors, IPIC as Strategic Partner, The National Archives as the official partner and Emirates airline as the official carriers, in cooperation with Emirates Racing Authority, IFAHR, Emirates Arabian Horse Society, Ministry of Foreign Affairs, General Authority of Youth and Sports Welfare with and sponsored by Ayadii LLC, Global United Veterinary Services LLC, Bloom, Petromal, Rise General Trading Co. LLC, Hayatna, Wathba Stallions, Abu Dhabi Falconers Club, Emirates Falconers Club, Mohamed Bin Zayed Falconry and Desert Physiognomy School, Abu Dhabi National Exhibition Centre (ADNEC), Al Awani General Enterprises, Kabale, Omeir Travels, Dr Nader Saab Switzerland, Laboratories Fadia Karam Cosmetics, YAS Channel, Racing Post, Paris Turf, Al Wathba Centre, the UAE's General Women's Union, The Supreme Council for Motherhood and Childhood, the HH Sheikha Fatima Bint Mubarak Ladies Sports Academy, Abu Dhabi International Hunting and Equestrian Exhibition 2016, Abu Dhabi Equestrian Club, Eastern Mangroves Suites-Abu Dhabi by Jannah, Anantara Eastern Mangroves Spa and Resort.